In my second year here at WGS, I had a conversation with the Primary Head of School about how we might cater more effectively for some identifiable students with mathematical talent in our school. She was wondering out loud whether the Westpac Maths Competition would be a good idea. But then I remembered entering students from my previous school in the Mathematics Challenge For Young Australians (MCYA for short) and how I thought that it was a well constructed competition that focussed on the application of mathematics to problem solving situations, rather than being an exam type scenario conducted within a day. We tried it out that year across several year levels, and the students really found it engaging. We even had a group of high ability Year 4 students who we entered into the Year 5 division. I remember sitting with this group, explaining how the challenge worked. You had four worded problems to solve, you had three weeks to do the challenge, you could work with others, you got to work independently, you had to show your working out, you sometimes had to explain your answers and so on. Later that week I checked in on the students and one boy made the comment to me with a smile that showed his keenness, "This is hard. I'm not used to maths being hard - usually it's easy for me." Interestingly, this same group of boys are now in Year 7, midway through this year's Challenge. I was talking to their teacher, Jasmin, tonight and she was telling me how much they loved doing the MCYA. They were begging for more time to get back into it, and so we were thinking that we might enrol them in the Enrichment section. It has also been a great validation for other kids - one that I can recall was a girl from a very disadvantaged background who downplayed her abilities in front of her peers to the point where she started to believe that she was not much more than average. We put her in the competition and with a bit of gentle encouragement she slowly warmed to the expectations and realised that finding the solutions was well within her capabilities and that she could see possible strategies that remained invisible to her peers. And her friends got on board and told her what they already knew but she was trying hard to deny - she was really smart and Challenges that privileged kids take for granted is theirs for the taking, were well within her grasp. She ended up with a Distinction. For me, this is a really great competition that gets mathematical kids stretching beyond memorised algorithms. I like the fact that it allows and encourages collaboration. I like how it draws out kids who are a bit dependent on their after school Kumon diet into thinking about not only what is the solution but WHY is that the solution. 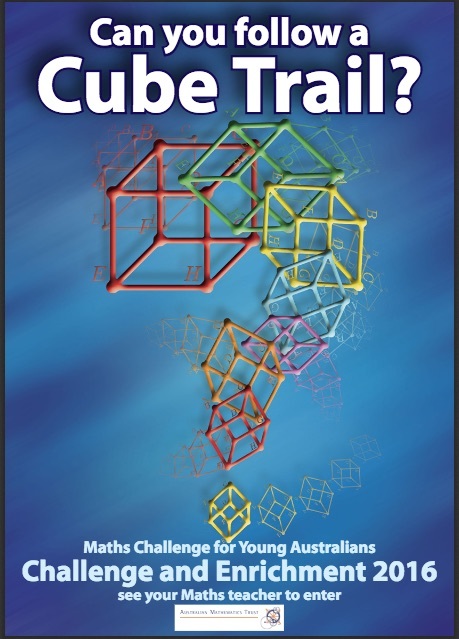 Thank you, Australian Maths Trust and the University of Canberra. You put out a first class offering for our talented Maths students and in this age of STEM heightened awareness, I am surprised that your competitions and challenges are not more widely touted. Posted in Learning, Problem Based Learning on May 25, 2016 by Graham. This week's maths focus was planned to be on time zones and I sat there on Sunday evening looking around for some web resources to help convey those concepts to my Year Seven class. For some reason, as I stared at the time zone map from worldtimezone.com, my mind wandered back to a conversation I'd had with a colleague about my favourite reality TV show Survivor. (Everyone has a weakness - cigarettes, gambling, golf, chocolate .... Survivor!) Sensing that maybe I was a reality television fan, she had also asked if I watched the show The Amazing Race. I've only watched the show on the odd occasion but her suggestion bobbed back into my mind as I pondered a hook, a reason for students to be exploring the concepts and the mathematics behind the world's time zones. So, in my typical style, I started designing a challenge that would blend time zone differences, travel times and choices that involved time calculation. I started by finding an easy to read Episode Guide site where each season had each episode neatly summarised in a paragraph. I decided that the focus would be just on moving around the world and gave Season One a try as a test run. 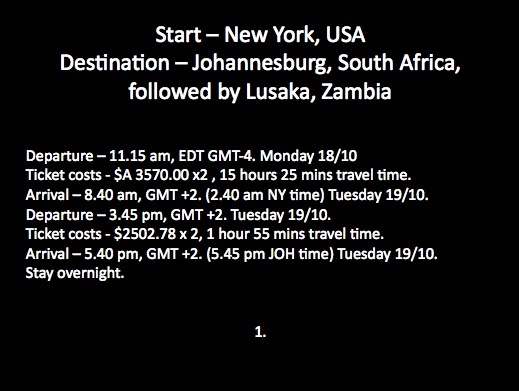 The first episode had the contestants starting in New York and flying to Johannesburg in South Africa, so I used Fare Compare to find flights starting today that would fit the bill. Even though money isn't a focus at the moment in our Mathematics, I figured it wouldn't hurt to add the ticket costs along the way as well. I also thought that getting the kids to use Powerpoint as a tool would be an easy way to standardise everything, making each slide a leg of the challenge. So, part of this Amazing Race is work out the best choices to get from one destination as outlined by that particular season to the next. You can see that my earliest choice for a flight was an 11.15 am flight from JFK (I know that this isn't quite how the show works but this provides the decision making element). I recorded that plus the GMT zone, the ticket costs (Fare Compare automatically converted the costs into Aussie dollars but if I used another site or a particular airline site, then there is always the handy XE Currency Converter site) the time spent travelling including time spent on stopovers, the arrival local time with a converted time for the originating time zone. That would be plenty for the students to play around with. So, the students are in teams of two or three and are aiming to cover at least two legs per day. After each leg, the team must program in an overnight stay before hunting for the next flight to the next destination. This may turn out to be too ambitious on my part but some teams covered three legs in today's hour. There are two "prizes" on offer - one for the first team to get through the designated season with correct calculations by week's end, and a second for the team that makes the best choices and solves the season in the least fictional time. In general, the kids really got into the task although a number needed help in navigating the complex Fare Compare site. The tendency was to punch the two destinations in and take the top result. With the premium being on saving time not money, students had to be shown how to sort the results to give the shortest flight times and make better choices. After all, no one wants to spend ten hours in one airport and seventeen in another before arriving at the required city 37 hours after departure just to get a bargain basement fare when a direct flight will get one there in under fourteen! We'll see how it goes. Posted in Middle Schooling, Problem Based Learning on October 18, 2010 by Graham. Creativity in education - most over used and mis-used phrase in the classroom. Exploring how a startup company approaches creativity. Design thinking - used by architects, design artists, media etc - focuses on the concept of immersion, synthesis, ideation and prototyping. Immersion - "When a wind blows, ride it." Education is naturally skeptical of new things and trends. Annual staff reviews don't make sense in a world where start ups look 3 months ahead at most. Changing plans is an "unattractive proposition" for education but it is impossible to see five years ahead for anything. Social TV - BBC Virtual Revolution. Re-consider education from the perspective of a young person - what you know isn't as important as knowing how to find out what you want to know. Use a Google form to ask your students what mobile devices do you own. Share those results publicly via blogs. How can you use these devices and the media they use (game based worlds etc) in your classroom? Sense of immersion means total engagement. Synthesis - showed a fast motion video of an advertising firm at work with a messy table where the team meets then breaks off to do individual work or pairs. Over time, the display board behind the meeting table takes shape and order while the piles of resources on the table lessen and become organised as the goals of the project reach completion. Showed Open Street Map which is like Google Maps created by the people for the people - a good demonstration of synthesis, showing his inside view of Mapumental. Synthesis is creating solutions to problems that have many different prongs. Use of blogs to summarise the day's learning to post out to the parent community - sort of like a learning Facebook update! Ideation - often seen in schools as brainstorming, shouldn't be the first thing done. People bring biases to the table in the brainstorm (cognitive bias) - done after the immersion and synthesis to remove bias. Cited the music industry as an example - videos at rock concerts, iTunes links in YouTube etc. An example from Tom Barrett - Addition in Adelaide. Social writing - using the blog to write a book in a collaborative way. Woodlands Junior School - another good example where 75% of Google's traffic for Mother's Day. Prototyping - 5,127 failures before Dyson got the prototype right for his vacuum cleaner design. People trying out things to see what works. People editing the maps when the Haiti earthquake struck to provide up to date details for rescue and relief services. Use tools like Google Fusion Tables. Creative writing adventures via Google maps and Street View - prototyping is "playing around" but heading towards a solution (story etc.). Risk analysis is something that needs to be negotiated with students, parents and community. Developing entrepreneurial learning is not about making money but starting with ideas as an individual but then connecting with others to bring their own ideas together. Ewan's Challenge: What passion can you discover and explore in 100 hours? It is one hour every day for 3 months - becoming an expert in that time. Posted in Conferences & PD, Problem Based Learning on August 25, 2010 by Graham. My students' blogs have experienced a flurry of comment activity since we returned from camp last week, with generous support from educators from all around the world. This has meant a real learning curve for my class in terms of being more diligent about checking for feedback, learning to be clearer in their own writing and beginning to learn how to facilitate written conversation with the adults who have offered encouragement and challenge in equal measures. Some of my marginally semi-motivated writers have become very enthused and engaged in their own digital writing now that they know people other than their classmates and their teacher are reading. The unwritten social expectations about who is a good writer amongst their peers and most likely to attract comments has also been turned on their head. Quieter, less academic, less disciplined students have received significantly more comments than some of the students used to their work being noticed. But good writing has been recognised. One of my students has even been mentioned as motivation in a Chris Harbeck blog post. (You should have seen the quiet smile of pride on this normally reserved and self-conscious student's face!) From a teacher's perspective, it now really becomes a process of letting go and seeing how they build on their original lists, seeing how they respond to the challenges others give to them in the comments. I wrote about this very promising start in my beginning of term newsletter in an article I'd like to share here. I've added in links where needed and changed student identities back to their online nicknames. One of the benefits of safely using online technology like blogs is the ability to learn from beyond the classroom. With our new inquiry topic and the class developing into a very good learning community, I felt the time was right to invite other teachers from my own online network in to assist with the class’s learning. All students have been publishing an initial post titled “ What’s Unique About Being Australian?” where they created a list of ten things they felt were uniquely Australian. Some students added links to specific websites, some added relevant images and others added their own written descriptions. Then, I promoted their posts on our classroom blog, my own professional learning blog and directed interested educators to add their comments. They were asked to have a read and leave them some observation or feedback about the students’ choices. I noticed a few comments coming into my moderation mailbox Tuesday afternoon before we left for our camp and this was quite exciting for the students. One of the first students to publish was Alex008 and she received a comment from Canadian Maths teacher, Chris Harbeck who asked what Milo was. The very next day, a student in his class brought a can of Milo and Chris posted a photo of himself with the can onto Flickr and e-mailed me the link to share with the class. As well as making the connection of an unknown name in the comment to a real person with a real face and a real classroom on the other side of the world, it showed the students that their unique Australian point of view does need careful explanation in their own writing. When I returned from camp, I had over 60 comments to approve from all over the world from educators (some classroom teachers, a few university staff and a couple of retired teachers) all adding in comments about the Top 10 lists, asking questions, making comparisons and pushing the students’ thinking. I enjoyed your list and the links with explanations! “Although I live in New York State [out in the country, a few hours from New York City], I admire John Howard and I’m glad to see him on your list. Australia should be proud that he’s a part of your recent history. Matthew K. Tabor, education consultant. And some students have really taken to responding respectfully in their own comments to improve their learning. Anast responded to her commenters in the following way. She is also planning to modify her list based on the feedback she has received so far, using the internet for learning beyond the four walls of our classroom. My apologies if I have mis-described any commenter's job description. Our next task is to look at the cultural characteristics of Australians without resorting to stereotypes - and once again, using the viewpoint of others from outside of our classroom will be invaluable. I'll keep you all posted. Posted in Blogging, Middle Schooling, Problem Based Learning on November 1, 2008 by Graham. I've been quite pleased with the way my students' blogs have progressed this year, considering the caution with which I have proceeded. I originally had volunteer Blog Coaches from my online network ready to interact with my students but Al Upton's class blog controversy and some advice I received in the aftermath had me re-thinking that concept. It was a shame because I really appreciated the helping hands that were offered to my students freely - and I feel as if I never really showed that appreciation properly. A lot of online interactions in the edublogosphere are built on goodwill and that may be why many of us (education bloggers and twitterers) are reluctant to criticise (even constructively) others because we don't want to sour the potential to collaborate. And that's what I'd like to leverage now - some of your goodwill. My students are starting an inquiry unit "What Makes Us Australian?" and I figure that their blogs are the ideal platform from which to explore more about their place in the world. But I need some help. My students don't have an online learning network of their own to help shape their thinking - so I want them to borrow mine. They have created posts that list 10 things they feel are unique to Australia. If you feel inclined pop over to my post on the class blog and follow the listed links to one of their posts, have a read and leave them some observation or feedback about their choices. You will notice that several people have already read and commented on some of the first posts from the class - their participation has already created a buzz and authenticity to the discussion that would not have occurred within the four walls of our classroom only. Having new perspective (especially from outside Australia) will be valuable in forcing them to justify their choices, consider new information and deepen their own understanding of the topic. This is different to the angle Doug Noon and I delved into last year on our Spin The Globe wiki and will be a much more individual exploration. Thanking you in advance for becoming new teachers for my students - you may even learn a thing or two about Aussies in the process. Posted in Blogging, Middle Schooling, Problem Based Learning on October 21, 2008 by Graham. These are my raw notes from my two days working along with my colleagues with inquiry learning exponent, Kath Murdoch, whom I've blogged about last year. Any reflections are in italics - anything I write regarding the topic of inquiry tends to viewed through the lense of the challenging ideas and questions posed by Artichoke, from whom I have learnt to be critical about any approach rather than adopting the default gospel approach favoured by many educators. The other thing about these notes are that the Friday sessions were presented for the whole staff (and other schools) so logically would normally be taken in first followed by the Assessment day next - but because it was a smaller, more experienced group attending on the Thursday, the main focus was reversed. What can I do to maximise my learning today? Record my thinking so that I can use the main ideas effectively. I also want to seek out some resolutions to the tensions between what I am reading from others and our school’s identified direction. Can’t do inquiry well without self assessment, can start by setting learning goals at the beginning of a lesson - possible short term goals are set out and the student reflects at the end whether or to what degree their goals have been achieved, kids need lots of practice to self assess. Short discussion around our table. Looking at student-centred assessment. Summative assessment cannot be the ultimate evaluation, going to need to know what the students have achieved along the way and that summative assessment is just “the icing on the cake”. Whole group activity ~ joining two halves of mixed up statements together. We then had to find a statement that posed a challenge for us. Is inquiry learning something we do to students but fail to use for our own learning? Negotiated curriculum is a two way street – I, as the teacher, hare a say in this as well. We can overdo the student voice angle and the students can see it as only their initiation. Clear, explicit learning intentions (know, do and be), explicit and co-constructed success criteria, prior learning and subsequent planning,pedagogy that encourages continual ‘revelation’ of thinking and understanding (especially though strategic questioning), formative and summative assessment tasks embedded in units – assessment AS learning. Self and peer assessment ~ as well as teacher led. There is a tension between UbD and Inquiry learning. The final assessment task does not need to be “set in concrete” ~ although UbD defines this as an important destination point. Weave in relevant ICT goals into unit planning. What will reasonable evidence of understanding look like? Broaden and deepen our understanding of inquiry learning, how to teach and plan. Teachers’ responsibility is to create educational environments, “ Teach me how to do it myself.” Challenged us to think of ourselves as learners and set a goal for the day, then identify the strategies / steps to achieve those goals. We want our students to have the skills and strategies to solve a problem. One tool is a set of cards that outline possible goals for learning for students ~ Students can pull one out of the pack to focus on during the lesson. All children bring experiences to the classroom, what do we do to remove the desire to ask questions? The big turnaround for an inquiry classroom is that the learners ask the questions, not the teacher. Examples of Student Questions - Why do dogs have faces? Why do popcorns turn into different shapes? How come your eyes don’t fall out when you bend over? True inquiry develops around questions. Questions are borne of curiosity. What can I teach my kids about questions? Question out loud in front of your students. At the beginning of an inquiry, use a strategy to establish prior knowledge. Structure task so there has to be some justification of choice. Knowledge is elastic and flexible - not fixed. What do we mean by an “integrated approach”? A sustained learning sequence in which students investigate a rich question/ topic / issue about the physical/social/ personal world, making authentic connections across the curriculum, long or short term, ongoing planning, embedded assessment. You need multiple examples for the students to examine, multiple sources of data to sort, and looking for connections, need to help some kids to “connect the dots” so that they do move from shallow to deep. I was very interested and pleased to hear a shift in Kath's thinking from last year and an acknowledgement that the internet has more to offer than a vast unmoderated information mine. Posted in Problem Based Learning on August 16, 2008 by Graham. This writing of this post has nearly been as drawn as the unit of work that I want to write about. But it needs to be documented as sharing what I actually do in my classroom is an important role of this blog. So, here goes. I'm starting to feel a little more confident about using the Understanding By Design process when co-planning our inquiry units. I've always used Resource Based Learning methodologies in my classroom (later rebadged as Problem Based Learning) but have never really planned as meticulously and strategically as in the last eighteen months. This is all part of our school wide push that places inquiry and UbD as the cornerstones of delivering a large slab of our curriculum (SOSE, Science, some parts of English and Mathematics as well as Technology) and part of my role as the ICT Coordinator is to model the strategic use of learning technologies in these units of work. I think I'm getting better at choosing the right tool for the right purpose (Dan Meyer's first vodcast drove home that point pretty clearly) and that helps when other teachers seek out my input on the effective embedding of ICT in their own unit plans. But the practice of co-planning teams planning and implementing our inquiry units has been driven by my progressively minded principal and our talented Assistant Principal who see inquiry as the pedagogical vehicle for managing our broadly defined curriculum. There is a scope and sequence planned that overlays the appropriate outcomes from Science, SOSE, Health and Technology tied to essential questions that guide the unit design. Explains the interrelationships between systems within living things, and between living things in ecological systems. They relate these ideas to the health of individuals and to threats to the sustainability of ecological systems. Identifies and describes significant resources, explains the threats which endanger them, and suggests strategies to combat threats. Interprets and represents data about natural and built environments, resources, systems and interactions, both global and local, using maps, graphs and texts. Identifies factors affecting an environmental issue, and reports on ways to act for sustainable futures. The behaviour of living things are interrelated and interdependent. Actions by humans can have positive and negative impacts on the earth’s ecology. It is necessary at times for human intervention to maintain a balanced, sustainable environment. Definition of environment, ecosystem, interrelated, interdependent, sustainable, ecology. Facts about Port River dolphins, their current environment, their anatomy and species, life cycle and identification of individual dolphins. 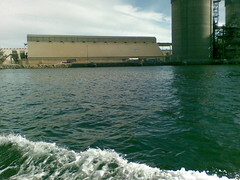 Facts about the Port River area and general history. One of my key ponderings that I gained from my global collaborative wiki project with Doug Noon and his sixth grade classroom was whether students at this age might be better off grappling with local issues rather than making the big leap into international connections. He had reservations about the in depth understandings gained about our respective cultures and although my class learnt a lot about the use of wikis, and how to pose more effective questions, I would agree that a deep understanding of our counterparts' lives was not achieved. In fact, the most beneficial thing we did as a class was a day excursion into the city of Adelaide as the resulting documentation of our own immediate surroundings meant a clearer perspective of what worth sharing with others about life here in South Australia. So this year with the key question "Can we really make a difference?" we decided that looking locally was definitely the key to engaging successfully with the key ideas and knowledge behind this unit. My co-planning partner and I decided that the example of the Port River dolphins would be an excellent lens through which to examine the question and the whole idea of human impact on natural environments and existing ecosystems. We started in with a tuning in activity where student groups were given five topic related images that were sorted in priority order and then had to justify their choice back to their peers. One of the initial catalysts for student engagement was our guest speaker, Ann, from the Whale & Dolphin Conservation Society. Her knowledge and expertise were backed by skillful presentation skills and the students were "hooked" into the concept of human impact on these very social marine mammals. Ann also provided the link to Dr. Mike Bossley, an eminent local scientist who happily fielded questions via email. I also got my students to view some online topic-connected video and got them to draw out initial connections in their blogs. By this point, the kids were gaining a fair bit of disconnected facts and concepts so it was time to it was time to head out for an excursion to make it all "real life". We took both classes down to the Port River and the Maritime Museum dolphin cruise - the kids were treated to more of Ann's expertise, and most importantly, headed out onto the water to hopefully view the dolphins in their own environment. You can see from some of the images taken by the students that the human impact along the waterway was very evident. There were more lessons and sessions picking apart the concepts of ecosystems etc. seeking to unpack the ideas and knowledge we had identified as being important but eventually towards the end of last term, we were ready for the final assessment task, designed to see if the students could connect the knowledge to the concepts. Now, in UbD, the final assessment task(s) is one of the first thing designed - the whole point being that way, you are always conscious of the purpose of the whole unit but we did change from our original task as in typical teacher fashion, we were overcomplicating our ideas. 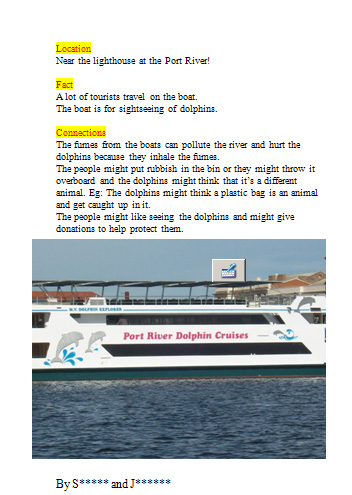 Finally, the students worked in pairs with a selected image from the excursion and they had to write some accompanying explanatory information including the location of the photo, facts established by the photo and finally the connections between the Port River dolphins and those facts. It became a very accurate way of assessing whether the students had come to a deeper understanding about human impact on the dolphins. Of course, all units could be better when viewed in retrospect, and the glaring element missing here isthat we didn't really get to determining whether we can "make a difference". Hopefully, that will improve in this term's effort but I believe that the students really did make headway towards a solid understanding of the big concepts of this unit. Posted in Information Literacy, Middle Schooling, Problem Based Learning on July 31, 2008 by Graham. Thanks to an invitation from Paul Allison and Susan Ettenheim, Doug Noon and I were guests on the Teachers Teaching Teachers webcast last week to discuss our global project, Spin The Globe, that we have worked on with our respective classes. It was great to chat and hear Doug's voice at length after working with him for half a year and I think we covered some good territory. Catching up with an experienced hand in Joel Arquillos who has trialled these sort of global collaborations in his classroom was a bonus as well. I'm actually keen to listen to it again because every time I participate in these Skypecasts my brain struggles to remember anything I've uttered as soon as I remove my headset. I took the liberty of adding the webcast to the FLNW wiki as my contribution to that event but I know that several interested educators were unfamiliar with the Edtech Talk setup and had issues with connecting to the live audio stream. So, here's the archived podcast - I'd love any feedback about any point that was made, either here or back at TTT. Spin the Globe--A conversation with Graham Wegner, Doug Noon, and Joel Arquillos. Posted in Information Literacy, Problem Based Learning, Web 2.0 on January 22, 2008 by Graham. This is a fictional post - any resemblance to real educators or this blog post in particular, are entirely coincidental. Once upon a time, not so long ago, a bright-eyed idealist ICT (edtech) coordinator discovered Web 2.0. It was love at first sight and he then started his own blog. One thing led to another as these things do and before long he was publishing wikis and attending online conferences and bookmarking madly and commenting all over the place. And while his own learning took off at an unprecedented rate, he struggled to work out how to utilise these new tools and methodologies into his own classroom. 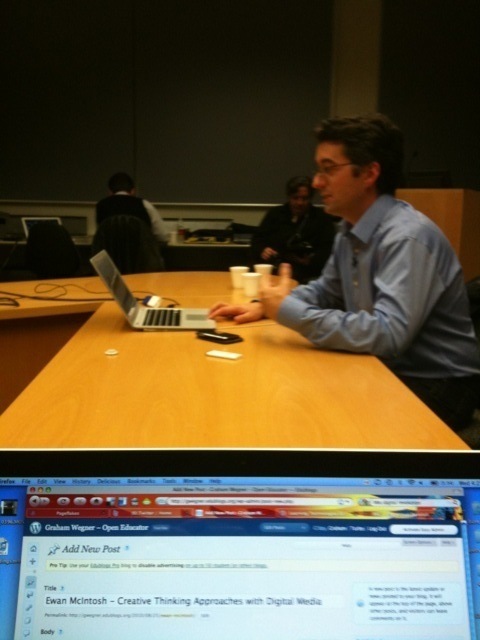 But he stuck at his new web-enabled style of learning, eventually establishing himself as a C list edublogger. He read "The World Is Flat" and "A Whole New Mind" as texts of almost biblical influence and networked worldwide with Americans and Kiwis and Brits and Canucks and even fellow Aussies. Teachers at his own school snickered at him at first, skeptical about his time management skills because after all, what hard working teacher has time to poke around on the internet? This year, the coordinator had a brilliant idea to leapfrog his students into the digital collaborative age - global projects. He'd seen wiki based projects and reckoned that they would be ideal for his middle school students focus on Communication. Being an educator with an inclusive conscience, he decided that it should be "Global Projects For All" in his four teacher block. He sat down and outlined his brave plan to his learning team colleagues. They seemed keen, having experienced wikimania in the previous year when their students used wikis to collaborate within their classrooms. And they saw the logical extension from that venture - connecting and working with students elsewhere in the world. What better way could there be to explore the process of digital communication for a real purpose? 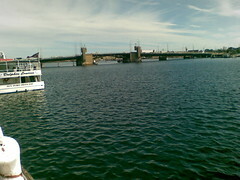 The coordinator's head swam dizzily with the possibilities - the students would grab this opportunity and make it their own, the teachers would experience first hand the power of global collaboration and the bridges of understanding between the citizens of the future would start to be built. But the coordinator had a tight rope to walk - these projects needed his support to get on the path to success but at a certain point, he had to stand back and let his colleagues steer their own ship. He leveraged his online learning network and lined up high quality teacher/classroom partners from North America, Asia and the South Pacific. He led out in his own classroom ahead of schedule and modelled a similar approach for the other teachers in his building. Then he stepped away giving his comrades room to breathe and find their own way. Plus he soon became engulfed in the process of keeping his own Global Project afloat. Back in his own classroom, his students worked hard with various digital media, building their wiki while the coordinator participated in email flurries with his global partner, anticipated and designed workarounds for the many barriers, made cross curricular links with the goal of getting the kids engaged in accessing primary sources of information to build their knowledge about a new part of the world. The coordinator checked in with his colleagues periodically to field technical issues and be supportive - but he assumed that if he wasn't being pestered then the teachers and their classes were going well. After all, he had worked hard to provide cutting edge partners for their projects. Then signs started to appear that maybe his learning team mates weren't all that taken or driven by this concept. Inquiring emails from the highly sought after global partners started to appear in the coordinator's Gmail box. "Is the class at your school still involved?" "I've sent three emails without reply and my class are concerned." "Is my partner class ready to start yet?" Things to be going astray for the coordinator. His comrades didn't seem to see the same importance of the venture as he did. One teacher took some personal leave but the message back to the global partner didn't get there leaving them in the dark about the status of the project. Another also took leave (but informed their partner) and the other teacher scored a new job. All of a sudden, the coordinator was juggling four global projects with different goals and various stages of progress. He was starting to realise that equity in this situation was a fallacy, that his lofty (and not always well thought out) ideas weren't shared by everyone and issues (and their possible solutions) that were as plain as day to him were puzzling and bewildering to others. "We've done some photo stories but they won't upload to the wiki." "You'll have to upload them to Teacher Tube first and then embed them in the wiki." "What's Teacher Tube? Perhaps you could do it for us." "But it's the last day of school tomorrow..."
And as always, the coordinator gritted his teeth, eyed off the list of priorities on his to-do list, glanced across at his own waiting class and conceded some ground. "If I get some time, I'll see what I can do. " Next year, he'll scale it all down. Next year, the teachers can find their own global partners. Let them spend hours on the web making their own online connections, he thinks uncharitably. But maybe there's the small moral hidden in this unremarkable tale. How can teachers appreciate the magnitude, the networking, the collegiality of the teachers already online, the sharing and the whole deal if some schmuck does the hard yards for them? How can they be totally committed to creating a unique learning opportunity for their students if they themselves haven't invested some virtual blood, sweat and tears? Posted in Future Directions, Problem Based Learning, Web 2.0 on December 22, 2007 by Graham. The biggest challenge I am finding is the expectation for a teacher or instructor while everyone talks about a facilitator. I don’t think someone can be both, primarily because a teacher inherits a significant amount of power and traditional roles that counter act the more neutral and passive presence of a facilitator. His battles are interesting to me because he points out that "almost everyone who is involved has experienced this type of schooled learning". The way things have always been done are a significant factor in Leigh's situation. And the battle between enabling learners rather than instructing them can be applied to any classroom situation, not just the uniqueness of facilitating an online learning community. "... I think that much of the discussion leading to the idea of a teacher—facilitator continuum stems from perceptions of teaching activity that, for many people (in the areas I deal in at least) are no longer really the case (ie teaching activity that is already quite facilitative and less didactic)." "I realized that losing the teacherly voice has nothing to do with losing the voice of an expert. You see, I’d thought that, in order to be a co-participant and a co-learner, I had to learn along with my students. Nonsense. I discovered that they need a figure of authority, someone who knows the topic well, who is an expert and can offer advice, support, and assist them as they engage with the material. The facilitator still needs to be the content expert. That is why people come to us - because they want to learn from us, not with us. And so, the challenge is that when I try to divest myself of my teacherly voice I need to remember that this process is not about losing the voice of the expert but about losing the voice of the authoritarian. I admit, this may have very little relevance in your class, with a group whose expectations, career goals, and age are so vastly different from my group of 14-year-olds. I do believe, however, that what everyone looks for in a teacher or an instructor, regardless of the type of educational setting, is that they be an expert and project that air of confidence and expertise. They do want to learn from us. And that’s why this whole process of building communities of learners and losing the teacherly voice is so hard. It is hard because we tend to think that what we need to create is the impression that we’re all in this together, that no one really is an expert in the classroom. The students won’t respond well to that. They pay their fees because they want access to experts, because they want to be taught, not because they can’t wait to be part of a virtual community of inquiry. So, what do we do? I believe that it is important to lose the authoritarian voice, the controlling voice, but not the voice of an expert who chose to teach because of his passion for the subject. The students need to see that the instructor is someone who lives and breathes whatever it is that they’re studying, that they have in their midst someone who has a wealth of expertise. They are in that classroom because they want a piece of it." The other voice I struggle to control when working with my class is the ''Guess what the teacher is thinking" line of conversation. That is so limiting and doesn't give any scope for my students to develop their own thinking or to describe their own processes but it is so easy to slip into this default mode. I like what Konrad describes in his classroom and it is directly applicable for my own situation because my students are similar in age range. Another interesting factor is that my students have to be in my classroom - they don't have the option to walk out if they feel my style and their learning needs don't gel. Leigh's working with adults who (presumably) have chosen to be part of his course and have the option of bailing out if they find the coursework is irrelevant or inaccessible. I'm wondering if learning as Leigh describes it being "individually responsible and self motivated" can be more successful in his adult learner setting if his clientele had experienced more learning in that vein throughout their primary and secondary schooling. Now, I'm still not sure which side of the fence I sit in regards to the concepts of "deschooling" and "reschooling" (or even maintaining the status quo) but in the hands of progressive teachers there are models that can work in terms of giving students opportunity to be more in charge of their own learning. I like to think that are structures in my own classroom (and many others) that certainly reduce the "authoritarian" and get away from the "one size fits all" model. South Australian state primary schools have composite year levels that force the teacher to cater for individual needs as you just can't follow "grade level" curriculum - it needs to differentiated because of the age and ability range in any group of primary age kids. They start school poles apart anyway in terms of whether there is a culture of reading at home, where they sit in terms of their sibling order, whether English is a secondary language amongst their family or just plain maturity levels. I'm in awe of how our best junior primary teachers handle these little people and work hard to engage them and keep their progress moving in laying the foundations for literacy, numeracy, thinking and social responsibility. The concept of student-initiated curriculum is an important one in the middle years of schooling but can be very badly implemented at only a lip-service level. Inquiry learning also has much to offer in offering students opportunity to follow their own path through particular concepts or skills – but again, as Artichoke has pointed out in the comments section here on my blog before, is something that requires a lot of work on the teachers’ part and can be easily mismanaged for minimal gain. But both approaches (and sometimes in combination) are a powerful option for the teacher to step out of the instructor role and into the facilitator role. Then the students hit high school and quite often, it’s all thrown out the window in the name of subjects that must be kept pure, lines that must be followed to lead to certain options like university courses. They’re all timetabled into fixed time blocks and the plasticity and ability to explore and discover is severely throttled back. I’m aware it sounds like I’m blaming high schools, which is not true but their very structure ultimately creates the adults that demand the teacherly voice when they front up for Leigh’s course. Of course, there are plenty of primary school teachers who step up and command their class’s attention from go to whoa, centring themselves as the foundation of all knowledge, making sure that the teacherly voice is the only one their students will hear for the entirety of their formal education. But primary schools here in this part of the world have that flexibility where the teacher can consciously step out of the role of instructor and create exciting learning opportunities for their students, with or without the help of technology. Maybe, it’s only deschooling that might produce the learners Leigh wants to interact with in his online community. Again, I’m as puzzled by the problems and potential solutions to really know what I think is the best solution – we’ve certainly heard about the concept of “learning to learn” a lot in our sector here – but it still has a way to go before these self motivated learners become commonplace and demand autonomy in their chosen education. Posted in Middle Schooling, Problem Based Learning on October 18, 2007 by Graham.